New without box! Shipping available to the United States and worldwide through the global shipping program! Payment expected within two days of purchase please! Thank you for viewing my listing! Logos: Clarks stamp on outsole bottom side under arch area. Leather upper, balance man made. (These are not the Clark's "Originals". They do not have the crepe outsole.). There will also be VERY minor crease marks & scratches as well. PU midsole reduces impact, while nylon shank promotes support and stability, and rubber outsole provides exceptional traction. Shoes are in pre-owned condition and show signs of light wear. Insole:11". These boots are in excellent condition with only the typical wear one would expect with gently-worn shoes. Mens Originals wallabee Clarks Boot Black size 9.5 Pre-own. Condition is Pre-owned. Shipped with USPS Priority Mail. Shoe Size Chart Conversion. Use the chart to find your size. Order Pickup: We do not allow orders to be picked up. No exceptions. For those who love the original Clarks Desert Boot, but want a more streamlined, lighter version, look no further than the Clarks Bushacre 2 Boot. Cushioned insole and synthetic lining make for a comfortable walking experience. Contrell Rise Ankle Lace-Up Boots. Boots are brown oily in color. Fixed with a heavy lugged EVA outsole, this Clarks Collection boot ensures shock absorption. This durable lace-up boot makes every step a breeze with Cushion Soft™ technology coupled with a removable OrthoLite® sheet footbed. Trending at C $93.78eBay determines this price through a machine-learned model of the product's sale prices within the last 90 days. Style: Ankle Boots. Material: Leather. Upper Material: Leather upper. We have maintained a 5-Star Service since May 2010 and we will continue our mission to serve you. Detailed Fastening: Lace-up closure. Leather outdoor boots and sandals for every occasion. Clarks shoes also has an array of shoes for both boys and girls that are comfortable for the growing kid. Fashion Sneakers. Boot Length: Ankle Boots & Booties. MODEL BUSHACRE 2. Style Ankle Boots. Color Blue. Condition The item in the picture is the one you will receive. (SEE THE PICTURES.). Please see pictures for more details. Minor scuffs and signs of wear. Thanks for shopping! Please ask any questions. These are in good used condition. Ryerson Dale model. Clarks Work Boots. Lots of life left in these classic Clarks boots. Hiking boot. Brown leather boots. Crepe sole. Full Grain Leather. Upper Material: Suede. Color: Black. Model: Wallabee. Style: Low Moccasin Boot. Size: US 8M, UK 7G, EU 41. 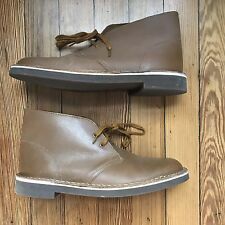 Clarks Mens Desert Boot Taupe Distressed Boots M- Pick SZ/Color. These Chukka Boots feature Lace Up fastening, cushioned insole and Leather lining.